These fantastic potluck bars come from Patrice Hurd of Bemidji, Minnesota, who won the grand prize in our 2012 Best of the Midwest recipe contest. Patrice says they're a twist on her grandmothers cracker bars. 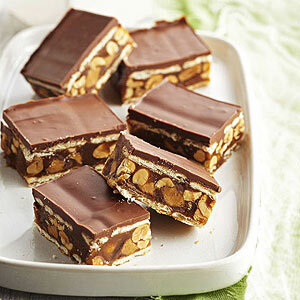 The bars cut beautifully and are loaded with salty-sweet-nutty-chocolately flavor. For topping, in a medium microwave-safe bowl, combine chocolate and butterscotch pieces. Microwave for 2 to 3 minutes or until melted, stirring every 30 seconds. Stir in peanut butter until smooth. Spread chocolate mixture over cracker layer; immediately sprinkle with remaining 1/4 teaspoon sea salt. Took these to a church dinner and the help sampled them, thought I would not have enough to serve. Had many request for the recipe from the help and guests. Have a husband that does not like peanut butter, but gave them a thumbs up. These are unbelievable. I'm not a baker and was very surprised at how easy they were to make. I have also been asked my many for the recipe. So glad that I found this one. whipping cream that is a liquid. I took these to a church potluck and they were raved over!